Reference number for this case: 31-Oct-54-Dijon. Thank you for including this reference number in any correspondence with me regarding this case. Following our article on Wednesday, relating the appearance of a strange luminous phenomenon in the sky of Dijon, Sunday at 7:25 p.m., several readers confirmed the report that was made to us by Mr. Louis Balland, residing rue Balzac. "I was returning to Dijon by car on the road to Saint-Apollinaire and my wife by my side had the same vision. In the descent that follows the cité Billardon and after having passed the works that are currently on the left side of the road, we saw a very bright white light, changing to steel blue color before extinguishing. We did not see any displacement, the appearance was too fast, and lasted only 2 or 3 seconds at most. This does not mean that there was no displacement, the phenomenon having appeared to us at its end and after we overcame an obstacle. As for the direction, this light appeared on our right, which would correspond quite well with the direction of the bridge of Ruffey relative to our road. I would add that when we got to the height of the fair, the street lighting went on. We thus noticed the end of a breakdown that we had not noticed. The Maladière neighborhood was not the only one that had blackened out, as the Place Darcy, the boulevard Sévigné, and the bell were also in the darkness (but not the Station district). For our part, we did not have the feeling it was a celestial phenomenon, but rather of an electric and terrestrial phenomenon." "On your article "A strange phenomenon in the sky of Dijon" I can affirm that the statements of Mr. Louis Balland can be taken into consideration, but the breakdown took place a second before this phenomenon appeared. The lights mixed in the following order: purple, red, yellow, and green, overlooking a wide expanse, I do not know the name of the quarter (I am not from Dijon), but it was towards the Langres road. Another person, Mr. K... O..., enrepreneur, saw the same "fire" on the side quoted by Mr. Balland. It seems that the reported phenomenon can be related to the short circuit which occurred at the same time and which deprived of electricity a part of the city for a few moments. This short circuit, which happened near the Cafe des Amandiers, at Fontaine-les-Dijon, had a voltage of 15,000 volts, caused a blinding light comparable to a violent flash. "Last Friday, around 4:45 a.m., three workers of the Emballages Company in Mussy-sur-Seine (Aube) were waiting for the bus which leads them daily to their workplace. Suddenly, in the direction of the north, they perceived a luminous device of rather golden color, and somewhat oval in shape, about the size of the moon. The machine made two turns on itself while remaining at the same height and continued its course before disappearing on the horizon giving the impression of falling. Light caused by power shortcut. [---] Article in the regional newspaper La Bourgogne Républicaine, Dijon, France, November 3, 1954. 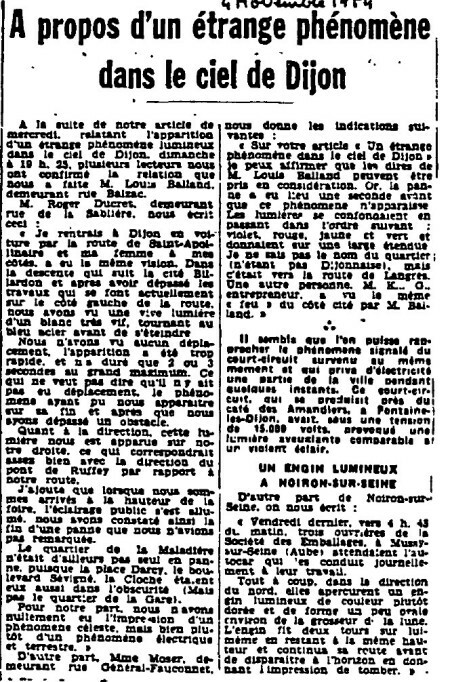 [br1] Article in the regional newspaper La Bourgogne Républicaine, Dijon, France, November 4, 1954. 1.0 Patrick Gross February 23, 2017 First published. 1.1 Patrick Gross December 12, 2018 Additions [vi1], [vi2]. This page was last updated on December 12, 2018.